Brainstorming a name for your startup is most likely going to result in bashing your head against a wall. If you have a company, product, team, or band the name generation process of branding is going to eventually sneak up and the full breath of how hard the process is will also be felt. Thesaurus’s will be cast a side, domain recommendation engines will be cursed at, and white boards will be filled with random lines connecting “thought” to “itsy”—in the end leaving everyone involved angry at each other or a more disjointed team. Unless of course you’re lucky enough to have a name that somehow spoke volumes to you right away and is available as a domain, in which case services such as NewCompany.name might not be for you, but for everyone else it could be a great help. 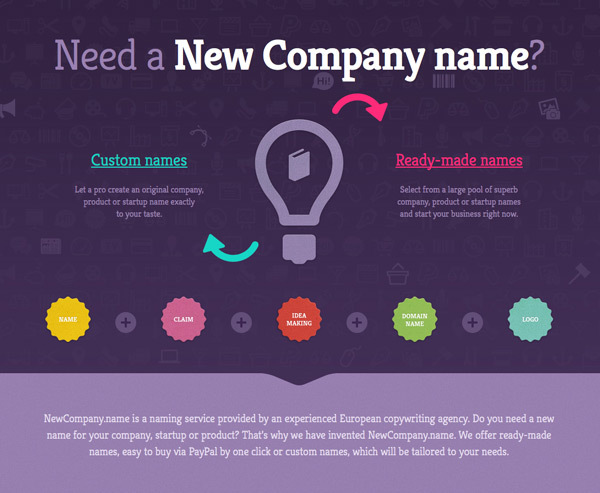 Naming is a creative process during which the company creates a brand new company, service or product name. But why should you let a professional copywriter think up a name for you? Because a “Pro“ has a lot of experience in creating new concepts, knows the language limits and is also aware of what’s trendy and what’s not. If you hire a copywriter to produce a name for you, you will get an original eye-catching and unique name which will attract the attention of your future customers and prevent you from having brain damage after endless days of trying to think of the perfect name on your own. “There was a gap on the market. You can only buy a domain name for some money and get actually nothing except the domain, or you can hire a big naming agency, which will give you a perfect name with a lot of material included, but this will ruin you financially,” explains Ivica Duricova, the owner and head idea maker at NewCompany.name. “That´s why we’ve started NewCompany.name. We represent the golden mean,” adds Ivica. The naming service is dedicated to everyone and even provides ready-made names at various prices which might be all you need for inspiration to apply to your own company. Otherwise a custom inquiry form asking for the details about your business is used to help get the process going and can take about 2 weeks to provide you with a new name for your venture.